The 6th annual World BPO/ITO Forum was held July 17th and 18th in New York City. Conference attendees represented buyers, sellers and, like Hydrakos Consulting, advisors of outsourcing services for technology and operations from around the world. Present were firms from India and China as well as some places not on the top of the list of outsourcing locations such as Argentina, Brazil and Columbia. Also attending were European firms based in Denmark and Bulgaria among other places. Among the speakers was Hasan Dewan, Global Head of Technology and Operations for Russell Investments. Among the insights he shared was the thought that outsourcing firms needed to broaden their focus to continue to be relevant partners. He recommended they look at a strategy of “multidimensional optimization focused on total value creation” for their clients. Dewan echoed the advice provided by another of the keynote speakers, Harvey Koeppel, President of Pictographics Inc. in pointing out that outsourcing companies are moving from a model where they look at providers for specific processes or IT projects to one where they want to buy a complete service. Dewan had and interesting way of looking at this. 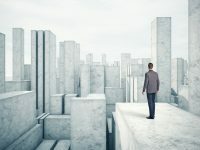 He said providers needed to switch to offering “Service as Software.” In other words instead of looking across business functions for offerings like process outsourcing or software development, they need to look at whole business processes to take on, such as client onboarding or invoice processing for example. The effect of this change will be that buyer firms will need to change their governance model for providers from the classic oversight role to one of service integration. Dewan offered a roadmap for optimizing outsourcing that included four main steps: Planning, Transition, Transformation, and Governance. While the steps in the process may not be new, the direction and emphasis are changing as the objectives of the outsourcing becomes more sophisticated and Knowledge Process Outsourcing (KPO) becomes more prevalent. Dawan highlighted Russell’s strategy of establishing an enterprise platform for services that enables outsourced services to be seamlessly integrated. The conference covered other topics such as the role of culture – corporate as well as country – in the transition to and governance of outsourcing; how Agile Development Methodology can be made to work in an outsourcing environment; and the impact of the cloud on BPO. The networking sessions at the conference offered a chance to hear a variety of perspectives from around the world including from those countries more recently on the scene. A side benefit of Argentina’s participation was an opportunity to taste that country’s excellent wines. We hope that’s a trend we’ll see repeated at the 7th annual conference.